This afternoon, I will have my first run in a bit over a week, the longest break from running that I can recollect within the past four years. I want to come out of my bad past marathon experience into good shape for the next one. But first, I need to get over my nagging injuries. I got these three pilates bands [Embark] (pictured) from Target. You see, I am thinking that Pilates will help me open up my breathing, regain my flexibility, and further my core strength. I already do a FitMoves circuit class 1-2 times a week to work on strength, but sometimes I wonder if it's more injurous than helpful. In fact, I had just made my return to the class after nearly two months due to worry that it would aggravate my hamstring tendons. My flexibility is now quite poor compared to what it used to be. Quite frankly, I have trouble fully extending one of my legs... and this is an attempt at getting some of it back. These bands smell very much like balloons because they are made of latex. I would recommend a good hand (and maybe foot) washing after using these, but they do the job and are long enough for me. The three bands were $9.99 and comes with a small pamphlet inside the box showing some basic moves. Sadly, those are the moves I've mostly been doing so far. And by "so far," I mean the two times I've gotten to it since I got the bands this weekend. On the floor. With my cat brushing against me as I do them. So these bands have so far been useful. I know they aren't top-of-the-line by a long shot, but neither is my need for them! 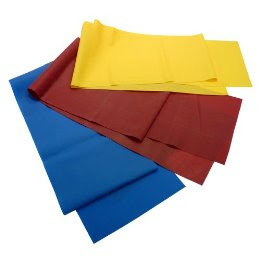 The yellow is light resistance, the blue is heavy, and red is medium. I usually use the red one. I'll follow up with a post on the specific moves that I will be doing routinely as soon as I find the right ones. Obviously, not all the Pilates moves require bands, but they are certainly nice for adding resistance to moves without carrying around a huge weight/dumbbell. My next step is yoga. I'm in the process of obtaining a Rodney Yee yoga video that will get onto my iPod (hopefully). "The Ukrainian" was talking to some other successful runners, and they cited yoga as something that is very helpful. I have NEVER been a yoga proponent simply because I don't like sitting still, so I am pursuing some envigorating kinds to also help with my flexibility. If you are feeling stiff and are having some trouble with flexibility, maybe you should look into Bikram. I went once and the heated room is nice for stretching out muscles. I could not get over the smell so I didn't go back but I've been thinking of going again...maybe. I think these things will only make you a better runner. Have fun! Looking forward to the reviews. Hey there! For some reason your marathon report never showed up in my google reader. I'm sorry to hear that it was such a rough race. Sounds like you're keeping it smart now with easing back in and letting the injuries heal up. On the yoga front, my husband swears by Rodney Yee. I wish that I could get into it - I've always hard a hard time just sitting still, too, but I know that it would be a great complement to all the stresses. Love the new layout! Love!